This move improves your shoulder health AND makes you look good in your backless tops. You can certainly look better (and even have less shoulder and neck pain – BONUS) in your summertime backless tops and dresses with a little more muscle tone in your mid-back. Here’s a simple exercise you can do at home or on vacation with just a band. We can this the Band Pull Apart or Band Row. First step in the Band Row, grab a band. It doesn’t matter what type. It can be a loop, a straight band (like Theraband), a section of a Superband, or even the Figure “8” loop band you see in the video. 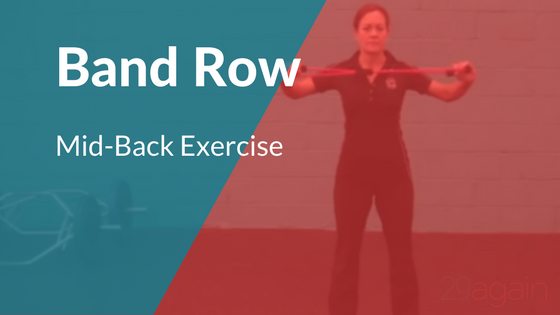 Hold the band out in front of you at chest to shoulder height with your palms facing down. There should be little to no tension in the band here. Then, keeping your palms down, pull the band apart as you drive your elbows straight(-ish) backward. As I remind my clients, Rule #1 is to keep your shoulders down (DO NOT shrug) at all times. If you have to let your elbows drop in order to follow Rule #1, go ahead and let them drop a little. We keep the reps in the high-ish range, 12-15,16. If you feel undue tension in your neck and upper traps, be sure to relax completely and let your arms come all the way down to your sides every 3-4 reps, or as needed.